For 5 years, 18-year-old Takumi (Jay Chou) has delivered tofu orders for his ex-racecar driving father (Anthony Wong). By night, Takumi ups the velocity and screeches his way around the dark slopes and narrow curves of the hills surrounding his home, perfecting the dangerous art of "drifting." 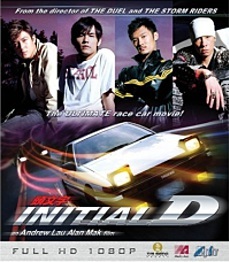 So fasten your seat belt and feel the adrenaline pumping full throttle as Initial D unleashes a new generation of racers... Where speed alone is just not enough. DVD Features: "Making of" Featurette, Deleted Scenes, Behind-the-Scenes Footage, Outtakes, TV Spots, Promotion Highlights. Spoken Languages: Cantonese, Mandarin, English subtitles, Chinese subtitles.